Oscar Wilde’s works have long been illustrated. Aubrey Beardsley did the first, scandalous illustrations to Salomé; Max Beerbohm worked up his own pictures for the play as well. George Percy Jacomb-Hood and Walter Crane illustrated the first edition of The Happy Prince. Charles Ricketts and Charles Shannon provided drawings for A House of Pomegranates; Ricketts went on to illustrate The Sphinx, and did the frontispiece for The Portrait of Mr. W.H. The artist who has, without rival, done the most to bring Wilde’s work into comics is P. Craig Russell. He has adapted four volumes of Wilde’s fairy tales, including The Happy Prince and The Selfish Giant. Russell’s adaptations are really very good, and they demonstrate his range as a comics artist. His images are elegant and subtle, with careful detail and even weight, when it’s called for; and they are rounder and more playful, more cartoonish, when that suits the story better. He quietly shifts along this scale, finding just the right pitch, and adjusting the visual style frequently within a given story, or sometimes, even, on a single page. Russell also did a version of Salomé for the third volume of his Opera Adaptations. In keeping with the play’s ancient, Biblical setting, Russell rendered it in the style of a classic fantasy adventure comic. 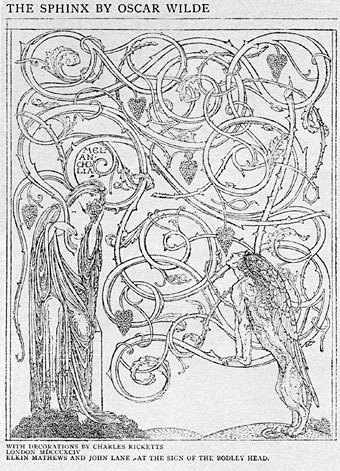 It lacks the lovely horror of Beardsley’s work, but, on the other hand, it is much better than some stage productions. Amusingly, Russell also inserted an image from Salomé into a fairy tale, The Birthday of the Infanta. The children watch “some Italian puppets appear[ing] in a semi-classical tragedy.” The image depicts the climactic scene; but with cartoon puppets it looks ridiculously cute — even the severed head, with Xs for eyes. This entry was posted on Wednesday, May 19th, 2010 at 12:01 am	and is filed under Essay, History.